Young people are constantly exposed to unrealistic standards in the media, such as airbrushed images, skinny models, and overly muscular models, and thus may feel pressure to lose weight or look a certain way. Because of these pressures, many children, teens, and young adults develop poor body image and low self–esteem. Although it’s normal for young people to not feel completely content while their body is changing, it’s important for your child or teen to find ways to feel comfortable with their natural shape and size. Body image and eating disorders are often perceived to be problems for girls and women, so there is some social stigma for boys and men who are dissatisfied with their bodies or engage in disordered eating behaviors. Generally, research shows that males report lower levels of body dissatisfaction than females; however, males do report desires to lose weight and be thin, and they may focus on muscle size, tone and definition, and maintaining low levels of body fat. Research has shown that for people who identify as gay, lesbian, or bisexual, rates of binge eating and purging by vomiting or laxative abuse were elevated, in comparison to their heterosexual peers. The risk of eating disorder behaviors such as restricting, purging, or binge eating are more common in certain sports that require weight restrictions such as wrestling or lightweight rowing, or put an emphasis on aesthetics, such as gymnastics, dance, or skating. These behaviors are also common in endurance sports (running, swimming, cycling), as the misconception of “race weight” may drive some of these disordered eating practices. However, athletes in all sports are at risk for disordered eating behaviors and poor body image, especially since coaches and athletic trainers sometimes do not have a thorough knowledge of eating disorders and may make triggering comments about an athlete’s size or shape in relation to their performance. Body distortion: Body distortion is when people see their body shape, size, and appearance differently from what everyone else sees. Body distortion causes a person to over–focus on flaws or imperfections and feel insecure. Most people who struggle with an eating disorder worry about how they look and what people think of them and have body distortion issues that can be hard to change. Buy clothes that your child likes and feels comfortable wearing and give away any clothes that make your child feel self–conscious or uncomfortable. Suggest relaxing activities such as listening to music, yoga, playing a game, singing, or meditating. Remind your child that everyone’s body is different and that not everyone is meant to be the same shape or size. Encourage your child to spend time with positive people with whom they feels completely comfortable around. Be critical of advertisements, magazines, and the media. Write a letter to a company if an ad is upsetting or hurtful. Smile when looking in the mirror. It might feel funny at first, but after a while, many people begin to see themselves in a more positive way. 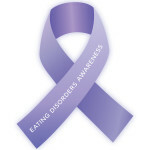 Myth: The media is the cause of all eating disorders. Truth: The media’s constant focus on dieting, losing weight, being thin, or being muscular can contribute to an unhealthy obsession with food and weight, but whether or not someone develops an eating disorder has a lot to do with other factors too.